A super boy fighting against ASD & T21: May My Son be a Mystery Diagnosis? May My Son be a Mystery Diagnosis? It is the first time, I am going to write about my suspicion that my son may be a mystery diagnosis. I decided to talked about it as a way to begin my celebration of the Genes Day, The World Down Syndrome day on March 21st. When I emailed to our families and friends announcing I was expecting a boy with Trisomy 21, I explained to them that the doctor's diagnostic was very optimistic. Now, the therapists confirm this optimistic diagnostic every time they say Tommy is accomplishing some age appropriate milestones. When I met our Developmental Therapist, she made a comment that I will never forget. She said that Tommy's main problem was more physical than cognitive. A few days ago, I was talking to our Developmental therapist about enrolling Tommy in a preschool that has a program for special need kids. She said I should be careful what school to chose because she was concerned they won't be able to understand Tommy's needs because Tommy's cognitive level is for a 2 year old kid; even although, he is not walking. This has increased my suspicion that Tommy may be a mystery diagnosis. 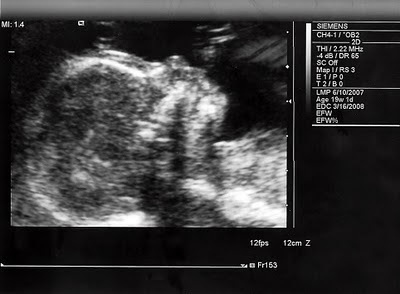 This is the picture of the ultrasound during the amnio. Trisomy 21. More than 90% of cases of Down syndrome are caused by trisomy 21. A child with trisomy 21 has three copies of chromosome 21 — instead of the usual two copies — in all of his or her cells. This form of Down syndrome is caused by abnormal cell division during the development of the sperm cell or the egg cell. Mosaic Down syndrome. Children with mosaic Down syndrome have two distinct cell groupings. In some cells there is a total of 46 chromosomes, which is the “typical” group. In other cells there is an extra copy of the chromosome 21, making 47 cells total for this group. Translocation Down syndrome. Down syndrome can also occur when part of chromosome 21 becomes attached (translocated) onto another chromosome, before or at conception. Children with translocation Down syndrome have the usual two copies of chromosome 21, but they also have additional material from chromosome 21 stuck to the translocated chromosome. This form of Down syndrome is uncommon. According to the International Down Syndrome Association (IMDSA), approximately 1 in 27,000 people are diagnosed with mosaic Down syndrome. Approximately 15% of individuals diagnosed with Trisomy 21 Down syndrome are misdiagnosed and actually have mosaic Down syndrome. There are many individuals who are never diagnosed with this condition. The differences between the Trisomy 21 and Mosaic Down syndrome are unknown because there are not enough scientist researches studying this type of Down syndrome. The possibility that Tommy was misdiagnosed is there because there were not enough tested cell to determinate if he has Mosaic Down syndrome. Retesting him is the only way we can confirm my suspicion. Right now, the most important for us is to stimulate our son as much as we can because the extra chromosome is there. One day we will talk to our son about his genetic condition. When this moments arrives, we will talk to him with the right information and not with a mystery diagnosis. There are many genetic disorders in the world that we even don't know, but as humans we should celebrate diversity. Diversity enriches our lives. Recognizing our similarities and understanding our differences is the best way to defeat prejudice and intolerance to create a more peaceful world where we all are included. Rosa Maria, despite any diagnosis, I strongly believe that Tommy should be in a school for typical children. Gabriel attends Kindergarten, with typical children, and he has a one-on-one educational aide to assist him. I am not quite sure what Gabriel's "developmental age" is at this stage in his life, but my husband's and my wish is for Gabriel to be challenged and included. Lianna, thank you for your comment. You understand how inclusion is important for us as parents and for our kids. It is good I found your blog because you guys are my inspiration and I am also learning through your experience of raising Gabriel. I am looking for schools right now because by next year we should decide what school to enroll Tommy and It will be the transition from the local Early Intervention Program to the School District. I am planning to attend to seminar where they explain the transition and what we should do. I am a little bit nervous about this transition because I am so used to my therapists. But I am doing everything ahead of time, to get ready for this big moment in our lives as a family. I am a believer our kids should be challenged and included, as you said.